Top Rank boss Bob Arum says a deal is very close for his fighter, unbeaten Mexican/American Andy Ruiz Jr, to face unbeaten New Zealander Joseph Parker, for the soon to be vacant WBO heavyweight title. Arum, speaking on Radio Live, said there are a couple of things still to be worked out – the date, for example, with Arum preferring a January date over a December date – but he added he is “optimistic” the fight will get made. Arum also said that he is happy for the fight to take place in New Zealand; “boxing is a global sport,” the promoter said. And though Arum comes across as sounding quite confident his fighter, Ruiz Jr, will get the win, the Hall of Famer does call the fight a 50-50 match-up. Ruiz Jr, 29-0(19) does have fast hands and back when he was halting unbeaten fighters like Joe Hanks and Tor Hamer he looked impressive. But these last few months have seen Ruiz pull out of a couple of fights and face veterans when he has stepped into the ring. Will the Parker fight, away from home in New Zealand, bring out the best in the 27-year-old, or will it prove to be too big a step for Ruiz? Parker may not have Ruiz’ hand speed but Arum is perhaps being a little harsh in referring to the 21-0 contender as slow. 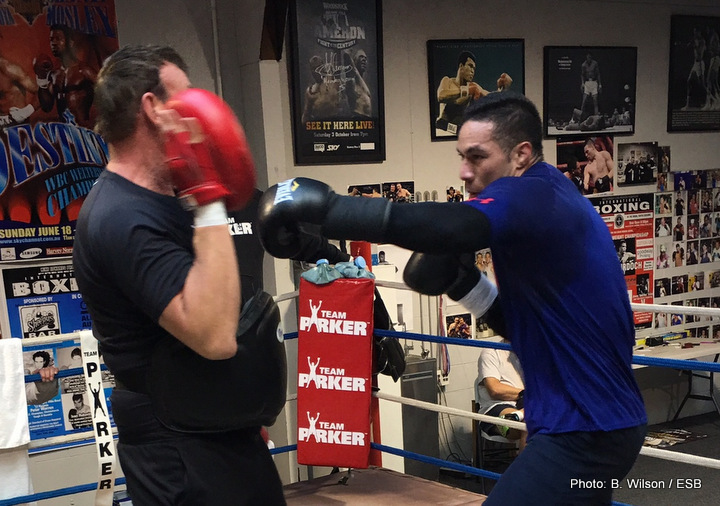 Parker didn’t look slow in crushing Alexander Dimitrenko last time out, just over a week ago. Fighting at home, as he looks set to do, Parker has to be viewed as the favourite to win the upcoming fight. Still, although Parker-Ruiz is a good, solid match-up, the winner of the WBO belt will have to prove a lot more if he is to avoid being called a paper champion.